And this last week I was hurrying to my car when I passed the manager of one of my regular starbucks (I know, sad that I have more than one). I was stressed out and ticked off and generally mad at the world and everything in it. And when she saw me she was like, “Michelle! Hi! Wow, you look like you’ve lost weight!” Excuse my superficiality here, but that just made my week. I’ve been feeling like a major fatty lately (what with my two meals of poptarts diet and all), and to hear someone say I look like I’ve lost weight was amazing. Probably means I am hallucinating and I am not in fact the 300 pound woman I picture myself to be sometimes. I finished my commute home feeling so much happier about life. And what was it? One little smile and a compliment. A coffee shop worker took two seconds out of her time to say something nice to this overworked lawyer, and it made my week. It has inspired me to get back to something I used to do back in high school. I would send handwritten notes on a regular basis to friends, just an out-of-the-blue hello hoping to brighten their day with a little snail mail. And once per month, I tried to do something REALLY nice for someone. Not for any reason other than to just be nice. Because a little niceness? Goes a long way in this often harsh world of everyone running about their own business. So I’m going to start trying to do nice things for people again. To think about others, to stop having this little pity party for my overworked self all of the time. And, despite the compliment above, still going to lay off the poptarts and cookies for awhile ;-). Yesterday morning, my mom and I spent most of the morning searching all over the Northern Los Angeles area (e.g., Burbank, Glendale, Pasadena, La Cañada Flintridge) looking for a chair for my new desk. I didn’t know exactly what I wanted, but I knew I would know it when I saw it. It was like my only little reality show a la “Say Yes to the Dress” except it was “Say Yes to the Chair.” I finally found the PERFECT chair at Costplus World Market in Glendale. Perfect pattern, perfect color, perfect style. I was sold immediately. “I SAY YES TO THE CHAIR!” I wanted to scream throughout the store. And then they would interview me about how happy I was to have finally found the chair of my dreams, and then show home video footage of me sitting in the chair in my loft, living happily ever after. (If you haven’t seen Say Yes to the Dress, probably none of that made any sense). However, as it turns out, Cost Plus apparently likes to keep lots of things on the floor that they don’t actually have in stock, has a firm “no selling floor models policy” and told me I could get a raincheck and get the chair in two weeks. Seriously?! I was heart broken. But not to be deterred, I continued searching the floor, and found another chair I liked. Not as perfect as the first one, but it had its own special charm. Alas, the “we don’t actually keep things in stock and won’t sell you this one” jerk policy struck again. I was envisioning that scene in Runaway Bride where the sales woman in the bridal shop kept insisting that Julia Roberts couldn’t afford the dress in the window and Richard Gere was all “she’s getting the dress!” as he took the manikin out of the window and carried it back to the dressing room. I wanted to just pick up that chair and say, “I’m getting the chair!” and carry it off to the front of the store. However, unlike the movie where it all works out and Julia gets her perfect dress, my story would probably only end in me getting physically removed by security. Sad times. (As a side note, why did I keep comparing finding the perfect chair to a wedding dress? Yet another sign that I might be in need of counseling of some kind ;-). And/or continue working on this whole “balance” thing so I stop thinking finding the perfect DESK chair for work is the most important decision in my life! ;-)). However, there was a really nice chair that I loved at a Home Goods in La Cañada. However, it was more $$$ than I had wanted to spend. I could totally afford the chair, I’m just still a major bargain shopper despite what I “can afford.” But ultimately, my mom convinced me to go back for that chair and I’m glad she did! 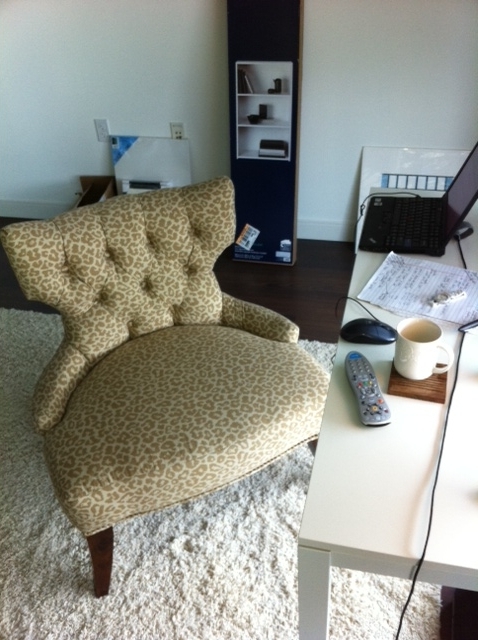 It’s bigger and more comfortable than the “perfect” chair at Cost Plus, and it looks great in my space. After my marathon morning of chair hunting, I spent the rest of the afternoon into the late hours of the night sitting in that chair working. Perfect timing I guess? Edit: I’ve added a photo. I know it’s not everyone’s cup of tea, but I love it! The author’ wrote it in the context of struggling to keep up with meals and cleaning and laundry and kids. She wants to live the fullest life, but doesn’t know how to find the time. She knows money is not the answer, time is the answer. Too Little Time Strikes Again. I found out yesterday that my health insurance was cancelled because apparently the system said I elected to waive my insurance, and since I did not review those changes before the end of open enrollment, my insurance was terminated. Now, they tell me, nothing can be done unless I have a “qualifying event” (e.g. get married or have babies). As if the CONSTANT engagement ring advertisements on FB were not enough, now suddenly my employer is telling me I need to get married. I know I’m single and almost 27, but sheesh! 😉 I got the email about my insurance while sitting in a deposition and almost yelled, “whaaaat?! ?” and had to walk out of the room to deal with it before I flipped out like that guy in Michael Clayton who cracks in a depo and starts taking all of his clothes off. I’m beyond frustrated but this is not the place to discuss all of the details. The point is that I have been so busy, that I neglected to notice my insurance was getting terminated. I’ve also been so busy, that I neglected to notice a credit card I never use had an annual fee that wasn’t paid. The credit card was cancelled, along with all of my accrued airline miles and along with, I’m sure, a nice hit to my credit rating. Of course, I don’t have time to check my credit rating, so who knows what it is these days. The thing is… It’s not that I actually don’t have time to read through my mail. There actually are hours in the day that I am not working. However, when those limited hours occur, I am so EXHAUSTED that the last thing I want to do is sit and read through what I assume to be junk mail. I don’t want to clean. I don’t want to go grocery shopping. I don’t want to get gas. I don’t want to call my bank and haggle over why I was charged a fee that makes no sense. I don’t want to go hang out with friends. All I want to do is sleep or watch TV. So now I have one more reason to bring some balance back into my life. This girl needs health insurance and a decent credit score. In other news, I ordered a new book this week about “dar[ing] to live fully right where you are.” I thought it sounded perfect for me, because I am the kind of person that is always looking ahead and missing what is going on right now. For most of last year I was focused on just making it through my first year, with no focus at all on actually enjoying that year. So I’m hoping this book can help me out. However, nobody warned me that the very first paragraph of the very first chapter contains fairly graphic details about the author getting birthed. Now maybe that rings beautiful with all the mothers out there that are likely reading this book as well, but for this 26 year old single woman who is mortified by the concept of birthing a baby, I really do not need to read about emerging through one’s mothers “tearing ring of fire” and how “[f]rom the diameter of her fullness, I empty her out–and she bleeds.” If someone could have just blocked out those first three paragraphs for me and wrote “Ann was born,” that would have been AWESOME. This is like when I was watching a slide-show of a relative’s home birth, unsuspecting that there would be actual graphic photos of the actual birth among the photos. Seriously, somebody needs to lie to me and tell me that babies really do still come from storks, or I am never getting pregnant. I felt like I needed a stiff drink after reading that. Which I’m pretty sure is not the point of the book. There is an article in this month’s ABA Journal about loving being a lawyer, with quotes from people about why they love being a lawyer. I’d be lying if I said I haven’t been doubting my own career choice lately, and occassionally feeling the sudden urge to cancel my lease, sell all of my possessions, and go work at a coffee shop somewhere. I’m not actually going to do that, but it crosses my mind. 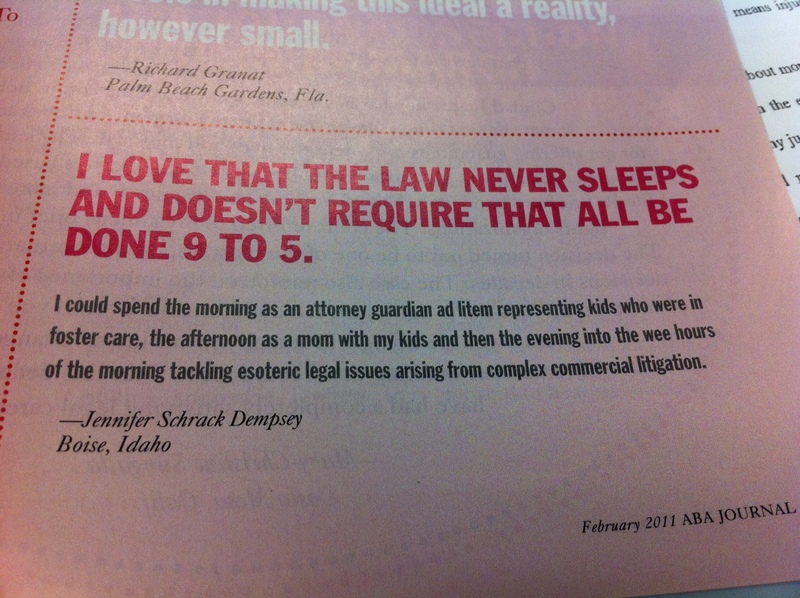 So I flipped open the magazine hoping to find some encouragement, and instead I see this quote from this woman from Idaho, grateful that the law “never sleeps” so she can work from the evening to the wee hours of the morning “tackling esoteric legal issues arising from complex commercial litigation.” Seriously?! That is what I HATE about the law. While I like the theoretical flexibility of being able to chill with my mom and non-existent kids in the afternoon and then work through the night, that’s not the way it actually works for me. I work all day so that I can work all night because the law doesn’t friggin sleep. I’ve been in my new place for about a month, but for the most part it looks like I just moved in. No dining room set and no office furniture means that 2 of 4 main areas of my loft apartment are furnitureless. The office area currently still contains random boxes of stuff I have yet to put away, empty boxes that need to be taken down to recycling, and a 24 pack of Charmin toilet paper, leaned gracefully against a wall. What can I say? I’m a classy girl, I like classy decor. Today I’m working from home because I’m still recovering from last week’s stint of working most of 3 days straight. While sitting on my sofa doc-reviewing, I suddenly decided I wanted to put this candle holder on the wall above my TV. So I took a 5 minute break, whipped out my hammer and iPhone leveler app, and took care of business. I LOVE it. It’s amazing how putting one thing on a wall can transform a space and make it feel more homey. Unfornately, I was so focused on getting it level and centered that I hung it a little higher than I otherwise would have liked and will likely end up moving it down. Also, the picture I have doesn’t do it justice (also, ignore the disorderliness), but I figured I would share one anyway. The votives are those fake plastic candles because I’m kind of freaked out by fire (and given I don’t have a sense of smell to tell when something is burning, it’s probably safer that I don’t intentionally start any flames in my home ;-)). These questions from Roots and Rings. 1. What’s your favorite kind of donut? Maple Bar! And once upon a time I lived in Tennessee where nobody had ever heard of a maple bar, even the workers at Dunkin Donuts. It was HEARTBREAKING! (But then I visited Alexander in D.C., who searched the city for maple bars and bought me about 3 dozen different kinds of donuts with maple frosting, before discovering that the local grocery store down the street had maple bars.. so I was surprised with like 4 dozen donuts when I arrived for a weekend visit). 2. Do you use the snooze button? Yes. I want to stop, but I can’t. Even if I put the phone across the room, I will run over to it, hit snooze again, and then run back to bed and fall right back to sleep. I sometimes hit snooze for like an HOUR. What a waste! Why not just get an extra hour of sleep if I’m not going to get up anyway? Ugg. Snooze-hitters anonymous anyone? 3. Do you write in cursive, print, or a combination of the two? Usually print. Never really figured out cursive. (Could be because when I learned a few cursive letters from my older brother, and then tried to use them before we had learned them in my second grade class, my teacher threw my paper away. So maybe I had a severe aversion to it after that. DARN YOU MS. GAIL!!!). 4. Tell us a joke. I’m not good at “jokes.” What do you call cheese that’s not your own? NACHO CHEESE. OoooOOOoooo, hilarious right? No? I know. Lame. English, some Spanish, some French. I originally started this blog to chronicle my adventures while I lived in Europe for 4+ months. I’ve been trying to keep it going since then, just to chronicle my regular life I suppose. But I haven’t been so good at keeping it going. I love to write though. I’d love to figure out something to blog about that would be interesting for me, and interesting for others, but I haven’t figured out what I want to write about yet. So for now I just write about whatever is on my mind when I have time. 7. Do you use bar soap or liquid body wash? Liquid body wash and liquid handsoap. I can’t really get behind using a bar of soap… For some reason it just seems dirty to me… which is funny since it is SOAP. 8. Do you buy bottled water? 9. What did you think of the Super Bowl Half Time Show? I missed most of it… but I did come back in time to see the running man thing… and I wondered how the people with light boxes on their heads must feel. Were they excited to be dancing in the half-time show with a lightbox on their head? “Look ma! I made it! I’m dancing ON STAGE with THE BLACK EYED PEAS. I’m the 9th person to the left with a lightbox on my head. Yeah! That’s me! WOO!” Really? 10. How do you feel about Steve Carell leaving The Office? I haven’t really followed the office in forever, so I really have no opinion. Can’t really imagine the show without him though! So now, when I’m reading a case and it has one of those fancy latin words written in italics, I can easily look it up and figure out what it means. You see, when I see latin words, I feel a little insecure because to me the italics mean “any smart person would know what this means, and we’re only talking to smart people here, so we’re only going to speak in latin and not explain ourselves.” Mens Rea, really? Why can’t we just say “criminal mind” or “criminal intent” so us average folk know what’s going on? I’m really bad about taking time to figure things out unless I have to. I’m kind of the go-full-speed-ahead-and-figure-it-out-later type. So, I don’t really stop when I see a foreign legal term in a sentence. I just hear those words in my head the same way the adults sound on Charlie Brown. And I move on. But not anymore. 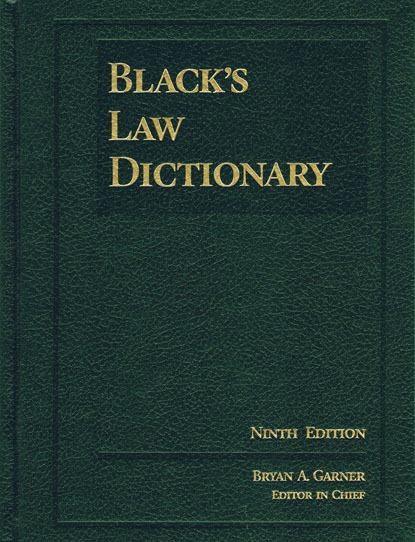 I will become a random legal term GENIUS 😉 Plus, it’s kind of fun to flip through the pages and land on really confusing legal terms like “mental suffering.” Hmmmm… What does mental suffering mean? I’m sure all lawyers need that in a dictionary, because we have no idea what mental suffering is like. Riiiight. I’ve heard that quote before (a joke from Brian Regan), and had no idea microwaving poptarts was even an option. However, on Monday, that quote became the reality of my life when at 7am I had “zap-fried” poptarts for breakfast, and at 4am (technically Tuesday at that point) I had “zap-fried” poptarts again. Techincally I would have enough time to toast them, but I do not have time to go out a purchase a toaster. My monday started with a bang at 6:30am with emails flooding my inbox for work, and didn’t slow down until 6:00am the next morning, when I finally laid down for a one hour nap. Tuesday went pretty much the same, except that time I had bagels instead of pop tarts, and due to such limited sleep, almost went into a profanity-ridden tirade at work when someone asked me to help with a project that turned out to be a total mess. Apparently pop tarts and bagels and one hour of sleep are not enough rest and nutrition to help a girl maintain her sanity. Who knew? After two days in a row of only sleeping for one hour in the early morning hours of the next day, I was apparently so tired when I laid down for a nap Wednesday that I slept through Ellie puking in my bed (while I was sleeping in it) and 3 missed calls with the phone right by my head. Awesome. Last night (wednesday night) I finally got a full night of sleep again. AMAZING. I feel mostly recovered, and intend to go into the office, but every time I stand up I barely have the energy to make it to the kitchen to get a glass of water, let alone shower and get dressed and run Ellie to daycare and drive to the office. I think I will work from my home office today, which currently = my couch, because I don’t own a desk yet. Because I don’t have time to shop. I really need to take Brian’s advice here, and loosen up this schedule! In less depressing news, I really like my new neighborhood. Walking Ellie is a relaxing breath of fresh air now, rather than a stressful experience of me trying to dodge all the random sketchy people that hung out around the bus stops and metro stop near my old building (including that one woman who was CONVINCED that I was a murderer. It was starting to get really awkward). However, given that the closest park is now 3 blocks away instead of right across the street, Ellie is having a difficult time figuring out that the sidewalk is not an ideal location to poop. I feel so awkward bending over cleaning up her mess in the middle of the sidewalk. I feel like everyone is glaring at me thinking, “your dog should know better.” Kind of like when kids throw a fit in a restaurant or grocery store and I tend to think, “get your kid under control already!” I know Ellie is only a dog, but she is gradually giving me a lot more grace for parents.